John C. Calhoun, Jefferson Davis: Will removing the names of Confederate leaders from schools gloss over history? 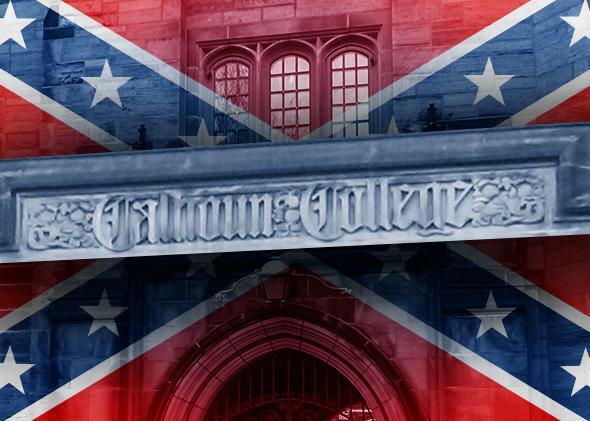 The names of Confederate leaders still adorn the halls of prominent universities. Is that OK? Calhoun College at Yale University is named after John Calhoun, a politician who strongly supported slavery. Photo illustration by Lisa Larson-Walker. Photo by Ethan Prater/Flickr Creative Commons. This post originally appeared on Inside Higher Ed. After a racially motivated shooting in Charleston, South Carolina, in June left nine black people dead, a nationwide conversation about the Confederate flag began. Politicians jumped on the bandwagon, major corporations removed merchandise displaying the flag from their shelves, and the topic pervaded social media and news coverage. At the University of Texas at Austin, students are lobbying to remove a statue of Jefferson Davis, the Confederate president. But for some colleges, it’s not just a statue under scrutiny but the whole institution—there are colleges named for people like Davis and John C. Calhoun. The debate isn’t just in the South. New discussion of the name of Yale University’s Calhoun College—a residence hall that has housed more than 400 undergraduates annually since 1933—has emerged since the Charleston murders. But the conversation began even before then, when an alumna published a piece on the university’s alumni magazine website in March questioning why the name has remained on the building for so long. Calhoun was a congressman, senator, and vice president during the early 19th century and is well-known for speaking in favor of slavery, describing it once as a “positive good.” He wasn’t just one of the many members of Congress from the South who backed slavery—he was a fierce and effective advocate, widely credited with promoting a political philosophy that eventually led to secession. “The university welcomes engagement and discussion on this important topic: the tragedy in Charleston, on top of countless preceding tragedies in our country’s history, has elevated public opinion and discourse on difficult subjects that have too long been avoided,” Karen Peart, a Yale spokeswoman, said in an email. Jonathan Holloway, the dean of Yale College at Yale University who has served as the master of Calhoun College since 2005, has in the past defended the name, saying it was important to maintain to understand its place in history and that removing it would erase Yale’s decision to name the college for Calhoun in the first place. But in a recent article in Salon, he is quoted as having slightly reversed his position, saying the events of the past 18 months have “rattled” him. “Yes, the historian in me still sees with alarm our national propensity to forget ugliness for the convenience of the modern moment, but the citizen in me just keeps seeing example after example of an inability to imagine that African-Americans have a humanity that ought to be respected,” he wrote. While the name has stirred up a debate, some have said they wouldn’t want to change it, arguing that it’s important not to gloss over one of the most contentious periods of American history. A similar conversation took place at Clemson University earlier this year when students lobbied for one of the main buildings on campus, Tillman Hall, to be renamed. Its namesake, Benjamin Tillman, was a well-known white supremacist who often spoke in favor of lynching and other acts of violence toward black people during the late 19th and early 20th centuries. Also featured on Clemson’s campus? The former home of Calhoun—converted into a museum—and the Calhoun Honors College. A. D. Carson, a graduate student at Clemson who helped to lead the movement to rename Tillman Hall, said the conversation on campus, where roughly 83 percent of the students are white, does not tend to focus on the names because students are unaware of the namesakes and their legacies. He said once students are aware, they’re generally surprised that such figures are honored on campus. Cathy Sams, a spokeswoman for Clemson, said the university was built on land that once belonged to Calhoun but was passed along to the founder of the university, Thomas Green Clemson, when Clemson married Calhoun’s daughter. After the shootings in Charleston, Clemson officials honored the victims by placing wreaths on campus—in front of Tillman Hall, a move that has stirred up further commentary online. The university’s Instagram post of the wreaths is no longer on its account. Carson said he encourages members of the Clemson community to refer to Tillman Hall as “Main Hall,” the former name for the building, as a way to remove the power of the name—a strategy he said would also work for Clemson’s honors college. “It was named to honor Calhoun, so to not give it the respect and honor that was bestowed upon it because we don’t honor or respect it—if we do that, it makes it much easier over time,” he said. Chenjerai Kumanyika, an assistant professor of communication studies at Clemson, said when people choose to honor those with racist histories by naming halls or monuments after them, they are not respecting history but rather honoring what some consider to be an offensive period of history. The Clemson Board of Trustees also voted in support of removing the Confederate flag from the South Carolina Statehouse in Columbia Monday but refused to change the name of Tillman Hall earlier this year, even after both students and faculty voted in favor of a change. Students at Duke University and the University of North Carolina at Chapel Hill have also lobbied officials to change the names of buildings named after white supremacists. In Alabama, both Calhoun Community College and Jefferson Davis Community College bear the names of controversial figures, one of whom was the president of the Confederacy during the Civil War. William Blow, who is serving as interim president at Jefferson Davis, said he has not seen any pushback against the name during his six months at the college, nor does he recall the topic coming up during his 20-plus years working at the Alabama Commission on Higher Education, including two years as executive director. At Calhoun Community College, President James Klauber said other aspects of Calhoun’s legacy, including his time as a senator and secretary of war and his work in expanding the land owned by the U.S., made him worthy of having a college named after him. “I think our students are educated and broad-minded enough to see more than one kind of sliver of a person’s life,” Klauber said. Klauber previously served two terms as a state representative in his native South Carolina and said it was a past vote in favor of removing the Confederate flag from the Statehouse grounds that ended his political career. And Ernest Williams, the chair of the mathematics department at Calhoun Community College and one of the sponsors of the college’s Black Student Alliance, said that even though he was raised in Selma, Alabama, during the height of the civil rights movement, the meaning of the name of the college never crossed his mind while he was applying to become a faculty member. He said students seem to be focused more on their classes than on the name, although he has confronted a few students for having items emblazoned with the Confederate flag. He said those students explained to him that they didn’t think of the flag as a racist symbol but rather as a part of their history—some of their relatives had fought in the Civil War.